Sisters Folk Festival 2018 is history. After a gut-punch cancellation in 2017 due to the smoke impacts of the Milli Fire, it was a grand thing to be back, and stronger than ever. Ceili’s friend Odin and his mother Shauna joined us — which was a very great pleasure. The Clan works hard through the weekend. I manage a venue and emcee, and assist Marilyn and Ceili, who keep the green rooms supplied and the artists well fed. It is all most gratifying. This year, we served up probably the widest range of music we’ve ever offered. Blues, Bluegrass, Tex-Mex, straight-ahead Folk, singer-songwriters… On Saturday night, in the space of three hours, we moved from Bluegrass to Soul to Afro-Cuban Canadians (with fiddle) on my Village Green Stage alone. Then the Clan headed off to close out the late night with Gangstagrass’ sublime mash-up of hip-hop and bluegrass. Boundaries of genre serve marketing (maybe) and media, but they aren’t too relevant to true music-lovers and certainly aren’t to artists. I got a kick out of guitar-slinging, soul-singing Ron Artis II waxing rhapsodic about Claire Lynch’s banjo man Jim Hurst during a soundcheck. Musicians like good music Period. One of the things that keeps me involved with Sisters Folk Festival is the joy I get from working with artists who are imbued with a tradition, but who are forging their own path, growing as individual artists and expanding the boundaries of the music itself, simultaneously. This phenomenon, itself, is part of a long tradition. What we think of as “Traditional Music” has always evolved and changed as people migrate and mingle. It’s never trapped in amber — and should never be. The tradition that is closest to my heart is the music of the British Isles, most specifically the music of my own Scotch-Irish ancestors. Where I “live” musically is where that music migrated from the Appalachian backcountry down to the border and picked up some African, First Nations and Mexican strains. Y’know. Texas. 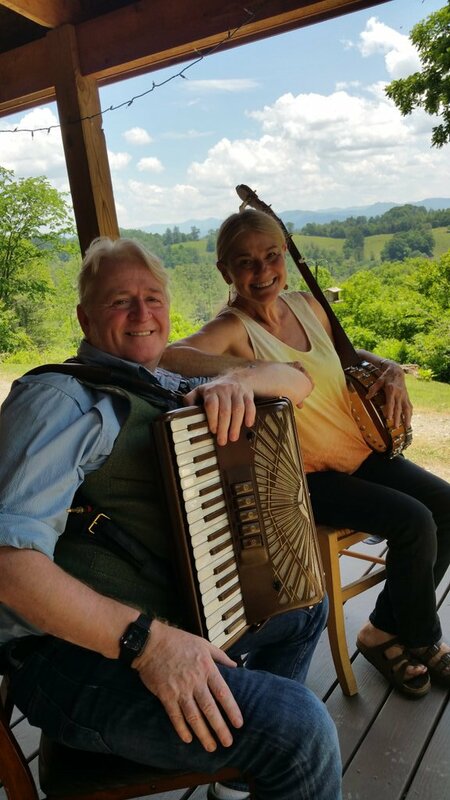 Phil Cunningham with Sheila Kay Adams, seventh-generation ballad singer. Musicology is a grand way to delve into cultural history. 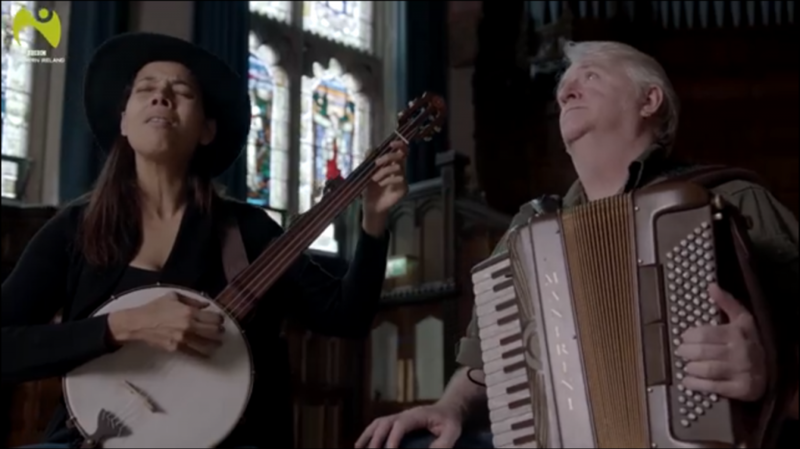 If you’ve got some time, it’s well worth investing in Wayfaring Stranger, a BBC doco on the music of Northern Ireland and how it migrated there, and from there across the seas. Oh yes ! a breath of fresh air after all that moral absolutism ! Musicology is a great way to delve into history, period, i would say. drop two names: Mack McCormack, Bruce Cornforth. but then i’ll rise and fight again. Sept 12. Johnny Cash died 15 years ago. Yes and I am still going although nearly out of breath. For the sake of posterity: above should be McCormick. to go down to Texas A&M Uni Press and start taking names ! Sounds like a great weekend. I wish I could have been there. I”m an old fan of Silly Wizard from the 80s and early 90’s Andy Stewart rest his soul. Scottish and Irish. Sorry but Celtic is Farby in certain hard traditional circles. ALSO check out new Coen Brothers film The Ballad of Buster Scruggs Best..
I’d forgotten about Buster. Looking forward to it. …….gorgeous Mexican film just got top honors. OK, you got me. Digging. Gangstagrass would be a fun one–but then, Justified is my favorite tv show, so I’m a little biased. You should have heard my wife and daughter hooting’ and hollerin’ when they did Long Hard Road To Come. Mr RTL, I read what you wrote about policing the other day, and just now re-Justified. It occurred to me you might like to have a look at Kent Anderson’s “Green Sun”. It is truly something special, highly recommended! Felonius, thanks for the recommend. I’ll check it out for sure! Glad to hear of this year’s successful festival and that some normalcy has returned to Sisters. Merriment has returned to the forest at last! Jordan Schnitzer Museum of Art starting on September 28th. P.S. So many great posts of late. You are [relentlessly] inspired and inspiring. I’ll make a point of it. And the trail IS right out of Tolkien. Love that drive, especially when it’s the Misty Mountains. I’m certain it was loads of fun! New “Outlander” trailer out. Looking even better. Holding on until Nov. 4th. As always, Lapham is timely and presented in fine fashion. Rivalry and Feud? Oh hell yes…. It be stockful of it! I think this Lapham’s is worthy of your pursuit.